This article refers to animals, which have foundered in the past and have been left with distorted feet. The feet tend to grow higher heels than normal, the soles are flatter than normal, the white line is abnormally wide around the toe, the front wall grows slowly and will eventually turn up like a Chinese slipper. 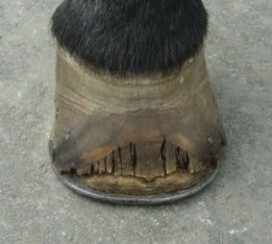 All chronic founder cases have growth rings on the hoof walls, which are wider at the heels than at the toes. This advice refers to chronic founder cases which are not currently suffering an attack of laminitis i.e. stable chronic founder cases. If they have laminitis at the moment then the vet should be called who will hopefully administer phenylbutazone and acepromazine, fit frog supports, confine the animal to a full deep shavings bed and advise the owner on a suitable diet! The horse should remain box rested for a month after it is sound in the stable without painkillers. 1. If the toes have become long there will be laminar horn build up under the front wall of the foot. This causes painful pressure on the underlying sensitive laminar corium. 3. If, following previous attacks of founder, they have been left with a degree of deep digital flexor muscle contracture (tendon contracture). This keeps the coffin joint too flexed resulting in excess weight being taken at the front of the joint and pain from the ligaments surrounding the joint. If the heels are lowered too much, in these cases, the deep digital flexor muscle and tendon are stretched. This makes the horse more lame. So what is the best way of keeping these cases comfortable? Usually by trying to remove or minimise all of the above sources of pain. If the horse can walk, watch its foot fall as it walks up a flat piece of ground. Watch from the front to see how it lands mediolaterally, e.g. whether the outside wall strikes the ground before the inside wall. Also watch it from the side as it walks past you to see whether the heels strike the ground well before it rolls over onto the front of the foot. Rasping the front wall of the hoof to shorten the toes, or pulling the toe back. If you have recent X-rays to work from these can help to indicate how much toe there is to be removed and how much heel to remove in order to straighten the three phalangeal bones. Do not pick up the foot and start dressing the foot down from the toe backwards as you might usually do with a normal foot. Most chronic founder cases do not have any foot at the toe-quarters to remove. Take the foot forwards on a foot stand and begin rasping the toe back. It is a good idea to stand these cases on carpet or rubber matting to ease their discomfort. If the horse is still fidgety, try pushing a roll of bandage or other frog support under the supporting frog, this may make the job easier. Keep dressing the foot forwards so that there is no curve to the front wall. It is often easier to dress and shoe on foot before starting on the other. It is a good idea to dress the foot to leave a square toe, not removing all the toe quarter flare. This is particularly important if you plan to then fit a shoe as there will be no wall left at the toe-quarters to nail to. Take a rest every so often as you dress the foot forwards and look at the foot from the side, you should see a straight line extending from the newest horn just under the coronary band at the toe, right down to the ground surface. You are safe to keep rasping until the front wall starts to yield to firm thumb pressure. You may expose a crescent of laminar horn as you dress forwards. 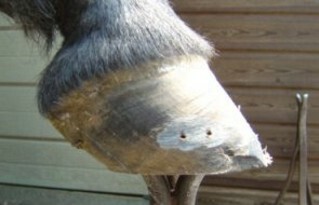 Any black lines indicating horn infection can be carefully cut out. This does not present a problem in dry weather, only in the winter if the animal is allowed to stand around in mud. 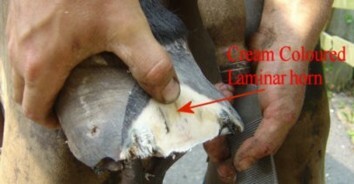 There is then a chance of infection entering the vulnerable crescent of horn and causing a foot abscess. Once you have the foot dressed forwards sufficiently you can then pick it up to deal with dressing the foot down. 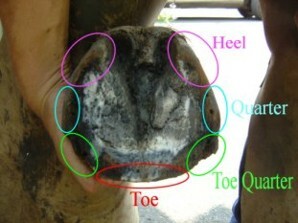 Dress the foot down from the quarters back, still don't touch what's left of the toe-quarters (see X-ray picture above). 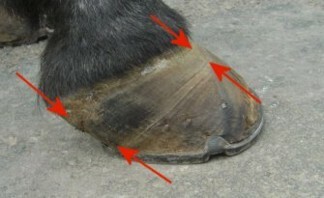 You usually need to remove enough heel horn to leave a straight hoof-pastern axis. In cases which you trim regularly look at the widths of the growth rings on the hoof walls and remove the same amount of horn from the heels as has grown since you last visited. In other words you will be removing a significant amount of horn from the heels and maybe nothing from the toes, which you will have controlled by dressing the foot forwards. The best way of avoiding sole pressure is to apply shoes to the affected feet, usually but not always the front feet. In this case we have altered a readily available quarter clipped concave front shoe. Be sure that the shoe is well seated out so that the shoe does not press on the sole and the weight is taken through the wall. 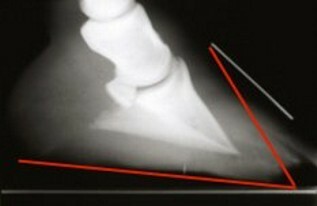 Many animals are more comfortable in correctly fitted heart bar shoes, all horses should have recent X-rays taken from which you can work whilst fitting heart bar shoes. If you chose to fit a machine made heart bar then it is wise to chose a shoe of sufficient thickness to allow for concaving or seating out to accommodate any dropping of the sole. Well seated glue-on heart bars are suitable for most chronic founder cases. Many stable chronic founder cases do not need heart bars so an open shoe, fitted with sufficient length and width at the heels will often suffice. We don't recommend using open toed bar shoes, as although they get the sole off the ground, they prevent the horse appreciating where its toe is. We feel that reverse shoes sometimes contribute to the development of deep digital flexor contracture. 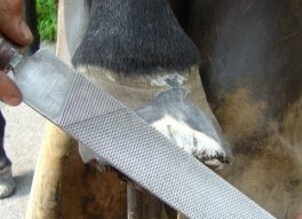 It is always a good policy to rasp the tail heads off so the horse does not rock on them when he stands on hard ground. It is amazing how unstable proud nail heads can make some horses. If the horse tends to land on its toes as it walks past you or is always shifting weight onto its toes, it may have developed deep digital flexor muscle contracture. Be wary of long tubular shaped feet or one with very high heels. 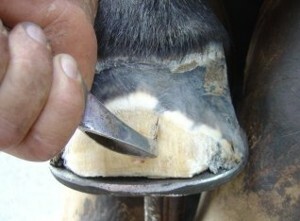 If you are concerned that this may be the case, then perform a toe wedge test before taking the cutters to the heels. If you take off a lot of heel from some of these cases they will lay down in the forge or stable and won't be able to get up again until to fix a wedge under the foot to raise the heels by the same amount as you have just removed! Very embarrassing. Placing a wedge under the toe has the same effect on the deep digital flexor muscle as lowering the heels - but without damaging the foot. Making a toe wedge test is straightforward. Make up a toe wedge by cutting out a shoe shaped piece from a plastic wedge pad. The reason we don't use an uncut pad is that in doing so you will force the horse to stand on its sole, which is likely to make it uncomfortable and confuse the test result. Place the wedge under the toe with the thick part under the toe and the thin end tapering down to finish at least as far back as the quarters. Have someone lift up the other leg and see whether the horse is comfortable to stand with its toe raised. If it doesn't fight to put it leg down but stands quietly then you are pretty safe to remove as much heel height as there is in the toe wedge. Click this to see pictures of a toe-wedge test. If he does not seem comfortable then you have two choices. You can leave him alone and suggest to the vet that the horse has deep digital flexor muscle contracture so that a decision on whether surgery to remove the inferior check ligament or cut the deep digital flexor tendon may be necessary. Or you can reduce the wedge height until he will stand to have his toe raised. You can then dress his heels down to a lesser degree.